Orange. That's the colour of the Canon PIXMA MG7560 that we were sent to review, and it sure made some people in the office mad. "Great printer, but I want it in black", they said. Clashing home decor issues aside, the PIXMA MG7560 is indeed a great printer that can produce stunning quality for photographs and colour documents. It's an A4 inkjet printer with a flat profile and a footprint that takes up about 43x38cm on a desk, and there is an A4 flatbed at the top for scanning and copying documents. The main paper tray sits at the base of the printer and can be loaded from the front, with prints appearing at the front on the output tray just above it. This means that the paper path is curved, but you would hardly know that from the straight, unbent output that is received. Six ink cartridges need to be installed before you can start using the printer, and these sit in the print head that travels left to right as the paper rollers feed the sheet below. You won't find capillary tube technology on this model. In order to install the cartridges, which include two black tanks, grey, cyan, magenta, and yellow, you have to lift up the top panel where the LCD screen resides. It's very easy to do, as the mechanics of it are smooth and well designed. The output tray, as well, contains mechanics that feel super-smooth when you open and close it, and if you forget to open it before hitting print, the printer will open it on its own. When you close it again, the tray extension folds up automatically. As far as relatively inexpensive printers are concerned (though $AU189 perhas isn't that cheap for a printer these days), it's a well-built machine. What's disappointing is that Canon still ships the printer's drivers on a CD rather than a USB stick. This shouldn't be a problem if you use Windows 8, as you can just use the 'Add Printer' feature in Windows and it will install it automatically. However, we tried with a Windows 7 Pro laptop that couldn't find it this way, and we also couldn't find Windows drivers listed on Canon's site. Since the MG7560 is billed as a Cloud printer, we shunned connecting it to our computers directly via USB and instead used Wi-Fi. The process of getting the printer onto our network was simple: we searched for the wireless network name, picked it, and then entered our password to authenticate the printer. The LCD screen on the printer is a touchscreen, and it was easy to type and select things with our index finger. Once you've got the printer connected to your wireless network, you can do nifty things such as connect to the Google Cloud Print service. Again, it's a simple thing to do: you enter the set-up procedure for it on the printer, and either print a URL or display a QR code to open the Web address that you need to use to authenticate the printer with Google Cloud Print. We were printing Google Docs through the Chrome browser in no time at all. With Google Cloud Print, you can print your documents from anywhere you have Internet access, and not only from desktop computers but mobile devices. Other aspects of the Cloud can be accessed if you install the Canon PIXMA mobile app, which allows you to connect more services with the printer, including OneDrive, Dropbox, Evernote, Flickr, and many more. You can choose to connect Google Cloud Print through this app as well, and we did this so that we could scan documents directly to Google Docs. Scanning wasn't as easy as we thought it would be. After initiating a scan through the printer's built-in menu, we were only given the option to scan to a PC connected via USB, or to scan to email. We couldn't use either of these options, and there were no options to scan to a computer or mobile device via Wi-Fi. We found it much easier to just use the Pixma mobile app to initiate scans (up to 300dpi, as PDF or JPG files) and store them in Google Docs for easy retrieval. An example of some of the images we printed using Canon's Photo Paper Pro. As for quality, the Pixma MG7560 impressed on many fronts. Its text output was free of excessive feathering and fringing. Meanwhile, its photo output was perhaps more impressive than expected considering the sub-$AU200 price tag. We printed a series of A4 images that were crisp and highly detailed, without being over-sharpened or murky between colours. Colours were vibrant, yet not too saturated, and greys and blacks were stunning. 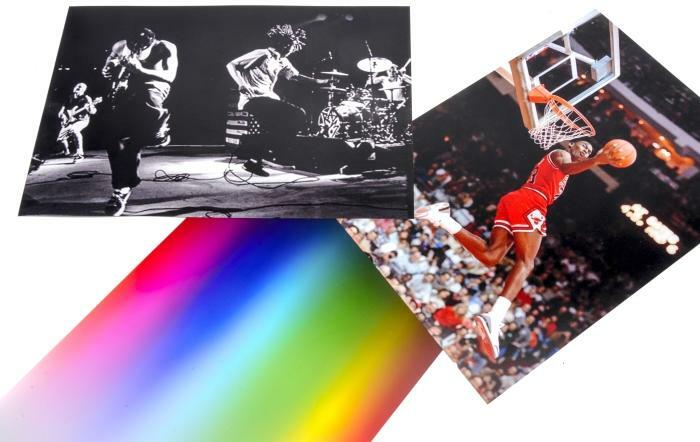 In particular, you can print black-heavy images (such as band shots) with excellent results. Pure black was deep and consistent, and gradients and blurs were all handled with a fine touch. We only picked up on some slight banding when we printed a colour gradient. Basically, if you want a printer for producing 4x6in or A4 images of your photos, but you don't want to go for a pro model, then this Pixma is a great choice. If you want to print out documents, it's fine for that, too, and it even supports automatic duplexing so that you can save a bit on plain A4 paper (great if you're a parent looking for a back-to-school printer for your kids). An 8-page, duplex print of a Web page took 1min 40sec in our tests. For photos, you can use Canon's Luster or Photo Paper Pro packs, which is what we used for our tests. Each photo was printed in 2min 40sec. Supported inks for this printer are the 651, 651XL series for all the colours, while a wider 650 or 650XL black tank is also supported. Replenishment for the six tanks costs around $AU138 if you were to buy a full set of standard models ($AU23 each), while XL models will set you back $AU173 ($AU28 each, except for the black 650XL, which costs $AU33). You can buy a value pack of these inks that costs a little less than the cumulative cost of the individual tanks. Yield will vary, but the colour inks have a stated number of sheets in the mid-300s, while the black has a stated yield of over 1700 sheets. How much you get will depend on what you print, and how often. Pick up this printer if you're after high-quality photo prints, and also if you want a Cloud printer so that you can more easily print over a network and from mobile devices. Bear in mind, though, that depending on your computer situation, driver installation could be an issue. You might have to do a bit of tinkering in order to set it up; and if you've never used Cloud features in a printer before, there will be a learning curve there, too. If al else fails, you can fall back to a direct USB connection to your desktop computer.